FIGURE 3. 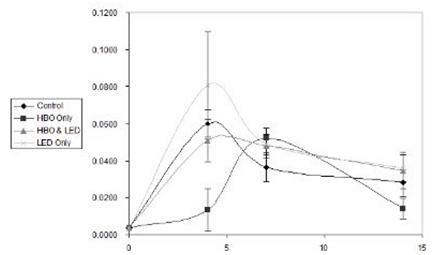 Change in basic fibroblast growth factor (FGF-2) concentration (mg/mg Protein) vs. Time (Day) in rat ischemic wound model. This work is supported and managed through the NASA Marshall Space Flight Center - SBIR Program. LED-technology developed for NASA plant growth experiments in space shows promise for delivering light deep into tissues of the body to promote wound healing and human tissue growth. We present the results of LED-treatment of cells grown in culture and the effects of LEDs on patients' chronic and acute wounds. LED-technology is also biologically optimal for photodynamic therapy of cancer and we discuss our successes using LEDs in conjunction with light-activated chemotherapeutic drugs. We have all heard how space technology can benefit us all here on earth; well this is no exception when we look at LED therapy. While the researchers in the field were fine-tuning their devices for pain relief, NASA needed a means to produce light without the added heat produced by incandescent light bulbs for space missions and their plant experiments. NASA settled on (LED’s) because of their ability to produce a scattered light of various wavelengths that were of benefit to plants in the confinements of a space vehicle in space flight, while producing no significant increase in thermal heat. They worked, and NASA took the next step. Could LED’s help in healing injuries to astronauts while in space flight. One of the major dilemmas for NASA regarding long-term space flight is the well-documented effect of muscle and bone atrophy that occurs to astronauts while in space. In addition it has been shown that injuries that occur while in space tend not to heal until the astronaut is back within the earth’s gravity. The LED’s that produced near-infrared light used in NASA’s research were shown to stimulate the basic energy processes by activating color sensitive chemicals within the cells. DNA synthesis in fibroblasts and muscle cells had been quintupled. The light absorbed by the cells stimulated the metabolism in muscle and bone as well as skin and subcutaneous tissue. What people and animals had felt through utilizing this technology in real life, NASA was proving to be true in the laboratory. Studies on cells exposed to microgravity and hypergravity indicate that human cells need gravity to stimulate growth. As the gravitational force increases or decreases, the cell function responds in a linear fashion. This poses significant health risks for astronauts in long-term space flight. 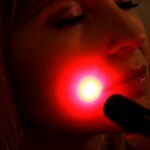 The application of light therapy with the use of NASA LEDs will significantly improve the medical care that is available to astronauts on long-term space missions. NASA LEDs stimulate the basic energy processes in the mitochondria (energy compartments) of each cell, particularly when near-infrared light is used to activate the color sensitive chemicals (chromophores, cytochrome systems) inside. Optimal LED wavelengths have improved the healing of wounds in laboratory animals by using both LED light and hyperbaric oxygen. Furthermore, DNA synthesis in fibroblasts and muscle cells has been quintupled using NASA LED light alone, in a single application. Muscle and bone atrophy are well documented in astronauts, and various minor injuries occurring in space have been reported not to heal until landing on Earth. An LED blanket device may be used for the prevention of bone and muscle atrophy in astronauts. 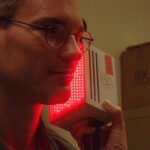 The depth of near-infrared light penetration into human tissue has been measured spectroscopically (Chance, et al., 1988). Spectra taken from the wrist flexor muscles in the forearm and muscles in the calf of the leg demonstrate that most of the light travel 23 cm through the surface tissue and muscle between input and exit at the photon detector. The light is absorbed by mitochondria where it stimulates energy metabolism in muscle and bone, as well as skin and subcutaneous tissue. Long term space flight, with its many inherent risks, also raises the possibility of astronauts being injured performing their required tasks. The fact that the normal healing process is negatively affected by microgravity requires novel approaches to improve wound healing and tissue growth in space. NASA LED arrays have already flown on Space Shuttle missions for studies of plant growth and the U.S. Food and Drug Administration (FDA) has approved human trials. The use of light therapy with LEDs can help prevent bone and muscle atrophy as well as increase the rate of wound healing in a microgravity environment, thus reducing the risk of treatable injuries becoming mission catastrophes. Space flight has provided a laboratory for studying wound healing problems due to microgravity, which mimic traumatic wound healing problems here on earth. Improved wound healing may have multiple applications that benefit civilian medical care, military situations and long-term space flight. Laser light and hyperbaric oxygen have been widely acclaimed to speed wound healing in ischemic, hypoxic wounds. An excellent review of recent human experience with near-infrared light therapy for wound healing was published by Conlan, et al (Conlan, 1996). Lasers provide low energy stimulation of tissues which results in increased cellular activity during wound healing (Beauvoit, 1994, 1995; Eggert, 1993; Karu, 1989; Lubart, 1992, 1997; Salansky, 1998; Whelan, 1999; Yu, 1997) including increased fibroblast proliferation, growth factor synthesis, collagen production and angiogenesis. Lasers, however, have some inherent characteristics that make their use in a clinical setting problematic, such as limitations in wavelength capabilities and beam width. The combined wavelengths of light optimal for wound healing cannot be efficiently produced, and the size of wounds that may be treated by lasers is limited. Light-emitting diodes (LEDs) offer an effective alternative to lasers. These diodes can be made to produce multiple wavelengths, and can be arranged in large, flat arrays allowing treatment of large wounds. Potential benefits to NASA, military, and civilian populations include treatment of serious burns, crush injuries, non-healing fractures, muscle and bone atrophy, traumatic ischemic wounds, radiation tissue damage, compromised skin grafts, and tissue regeneration. 1. Promotion of the rate of muscle regeneration after confinement or surgery. 2. Personnel spending long periods of time aboard submarines may use LED arrays to combat muscle atrophy during relative inactivity. 3. LED arrays may be introduced early to speed wound healing in the field. Human trials have begun at the Medical College of Wisconsin, Naval Special Warfare Command, Submarine Squadron ELEVEN and NASA-Marshall Space Flight Center. EXPERIMENTS USING AN ISCHEMIA ANIMAL MODEL SYSTEM PROVIDE PRE-CLINICAL DATA RELEVANT TO HUMAN HEALING PROBLEMS, CHRONIC NON-HEALING WOUNDS.